It's been a busy week on the Trade Show floor. 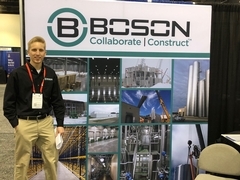 Boson Company personnel were in our booth at the 2-day International Cheese Technology Expo held at the Wisconsin Center in Milwaukee, Wisconsin. Industry professionals, cheese makers, and suppliers to the global dairy industry from 11 countries attended the event. The Boson Company is one of Wisconsin's premier builders of cheese and other food processing facilities. Boson also had personnel hosting a booth at the Wausau Business Expo. The Wausau Chamber holds one of the largest business to business marketing events in Wisconsin each year. This gives us a chance to meet new customers and introduce them to our Collaborate|Construct methodology of construction delivery.